SPICES? 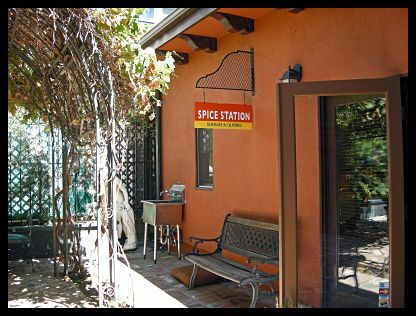 Did someone say… SPICES? You know what happens when a dog’s laying around in a pleasant state, minding his own business, and someone drops the word “cookie” in a conversation? The ears pop up, the head twists, and the inquisitive eyes tell it all: “Cookie? Did someone say … cookie”? I didn’t wag my tail, but I was ready to “woof!” It wasn’t easy to control my enthusiasm because, after all, I’d left all my spices – three drawers of spices– 1,345 miles behind. And I needed a whiff of at least the basic aromas. 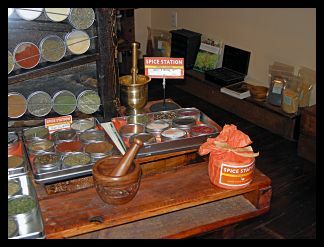 Having visited Penzey’s in the Bay Area, I didn’t expect to be awed, but I underestimated: Spice Station is a fragrant dream of a store! 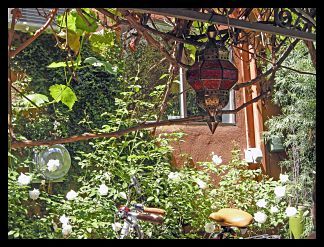 Inside a hidden courtyard, with doors wide open, enticing smells waft around and invite you to step inside and enjoy what they have to offer. Do you like masala mixes? I thought I knew them all, but a couple of theirs were new to me. Have you heard of Urfa Biber? I hadn’t. Care for special salts? 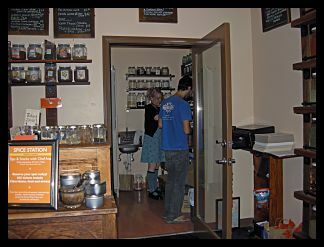 You’re in for a treat of smoked and infused salts that you can sample at will (I brought home smoked Yakima Applewood). 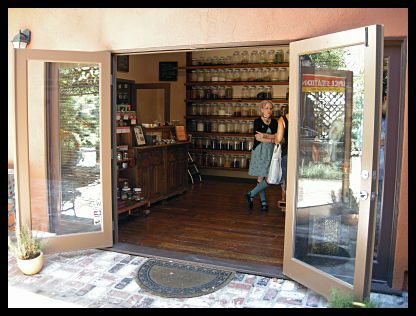 Dried peppers, curry mixes, barbecue rubs, endless herbs, seeds, pods, and a huge selection of teas. They sell a rare Chinese white green tea, “pai mu tan, ” that’s hard to find except from special tea importers (it’s my favorite!). 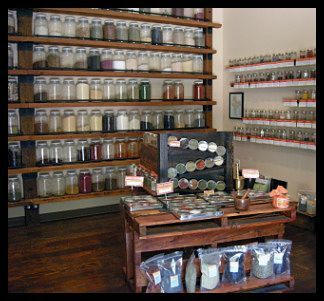 Not only does the Spice Station carry an amazing stock, but they’re all elegantly displayed in beautiful bottles, perfectly spaced on charming wooden shelves. 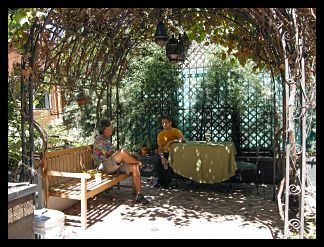 The owners and staff are super friendly, knowledgeable, fun to chat with… and patient! The poor guy in charge of my order didn’t even blink at my long list of spices. He stood by the balance, weighing away, writing and labeling and moving to the next spice… and the next… and the next…. That looks wonderful! The first time we visited California, we were riding around with friends and I spotted a Trader Joe’s! We didn’t have them in Cleveland yet, and I almost jumped out of the car! They laughed as if to say, What’s the big deal. I’m so glad you’re enjoying yourselves. Be sure sometime to visit the Getty Museum. Takes a whole day, but it is great. 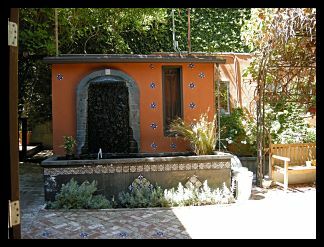 Will definitely go to the Getty Museum, it’s on our list… Last time we were in LA, many years ago, we drove by but could not visit. The place is gorgeous! How lucky you are to have family to show you all the best places. The Spice shop sounds exciting.